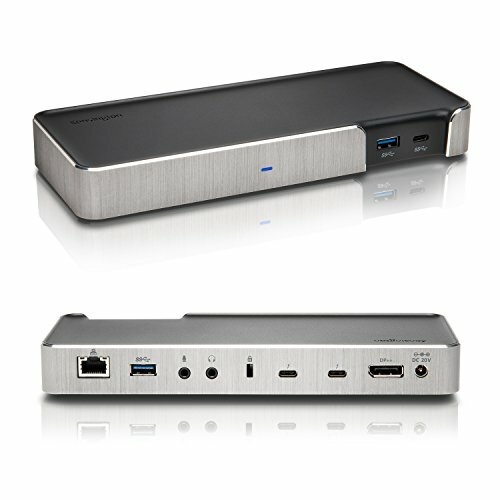 Kensington's SD5000T Thunderbolt 3 Docking Station for MacBooks was engineered by Kensington to be high-performance productivity tool for video editors, graphic designers, content creators, gamers, or just someone who wants to simplify a 4K workspace. With the SD5000T dock, you get more—more speed, more pixels, more power, and more possibilities. The SD5000t dock provides two Thunderbolt 3 ports, and provides up to 85W of power to your laptop using the same Thunderbolt cable that carries data to and from the dock. The dock also provides a full-size DisplayPort, a USB C port, two USB 3.0 ports (one with 2.1a charging), gigabit ethernet, a headphone jack, and a microphone jack. A Kensington lock slot is built in, for use with a Kensington cable lock to protect your investment. And the dock is VESA mountable (VESA mounting plate sold separately) to help keep your desk clear. For over 35 years, Kensington has been The Professionals' Choice for desktop productivity solutions.